A renowned Generation X / Generation Y classic, it has developed a strong following as a cult film. The film describes a world in which the titular Matrix is an artificial reality created by sentient machines in order to pacify, subdue and make use of the human population by growing them and connecting them to the Matrix with cybernetic implants (making them cyborgs). It contains numerous references to philosophical and religious ideas, the hacker subculture, and homages to the style of Hong Kong action movies, Japanese animation and cyberpunk. The film is a co-production of Warner Bros Studios and Australian Village Roadshow Pictures. The Matrix was filmed in Sydney, Australia. The movie's relatively unexpected mainstream success outside of cult following led to the greenlighting of the next two films of what the Wachowskis maintain was conceived as a trilogy, The Matrix Reloaded and The Matrix Revolutions. It was a number of years and several iterations of scripts before the final movies were approved, and there is continued debate among viewers over whether they genuinely exceed the quality and conceptual heights of the original film or are disappointing lesser achievements. Also released was The Animatrix, a collection of nine animated short films created in the Japanese animÃ© style that was a strong influence on the trilogy. The Animatrix was overseen and approved by the Wachowski brothers but they only wrote four of the segments themselves and did not direct any of them; much of the project was created by notable figures from the world of animÃ©. Four of the films were originally released on the series' official website; one was shown in cinemas with the totally unrelated movie Dreamcatcher; the others first appeared with the DVD release of all nine shorts. The franchise contains three video games: Enter the Matrix, which depicted events linked to the story of The Matrix Reloaded and which contained footage shot specifically for the game; The Matrix Online, a MMORPG which continues the story beyond The Matrix Revolutions; and The Matrix: Path of Neo, which was released November 8th, 2005 and focuses on situations based on Neo's journey through the trilogy of films. Available on the official website are a number of free comics set in the world of The Matrix and written and illustrated by figures from the comics industry. Some of these comics are also available in two printed volumes. 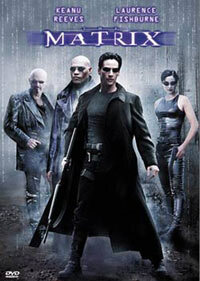 The Matrix earned $171 million in the USA and $456 million worldwide. A computer software programmer named Thomas A. Anderson (Keanu Reeves) leads a secret life as an elite hacker under the alias "Neo" in what appears to be an American city, in the year 1999. A series of unusual events brings him into contact with a group of people led by Morpheus (Laurence Fishburne). Morpheus, a practitioner of critical pedagogy, offers Neo an opportunity to learn what the rumored Matrix truly is. Neo is pulled from the false reality and into the real world and discovers that the year is not 1999, but closer to 2199 (although it is not able to be given exactly). Humanity is fighting a war against intelligent machines. In order to deny the machines their power source (solar energy), the humans "scorched the sky", permanently blocking the sun's rays from reaching the Earth. The machines responded by making use of human beings themselves as an energy source. It turns out that the world which Neo has inhabited since birth, the Matrix, is an illusory simulated reality construct of the world of 1999, developed by the machines to keep the human population docile whilst they are connected to generators and their energy is harvested. Morpheus, with the other free humans, works at "unplugging" humans from the Matrix and recruiting them. Morpheus has rescued Neo from the Matrix because he believes that Neo is "The One," who has been prophesised by the Oracle to "hail the destruction of the Matrix, end the war, bring freedom to our people." Morpheus believes that Neo has the power to free humankind from its enslavement through complete mastery over the Matrix. Neo, along with the other members of Morpheus' group, is initially skeptical, but Morpheus teaches him to bend or break the rules of the Matrix - subvert the operation of the normal laws of physics. Neo also forms a close personal relationship with a female member of the group, Trinity (Carrie-Anne Moss). Inside the Matrix, the humans are pursued by a group of self-aware programs, called Agents, who have incredible martial arts skills and capabilities beyond those of the humans. Neo meets with the Oracle (Gloria Foster), who, as in the traditions of Oracles everywhere, presents him with an ambiguously-worded prediction of his future. Shortly afterwards, Morpheus, betrayed by Cypher, who prefers living in ignorance of the Matrix, is captured by the Agents, who attempt to gain from him information regarding the defences of Zion, the last human city of the real world. Based on what the Oracle said to him, Neo decides to rescue Morpheus. Together with Trinity, he returns to the Matrix and rescues their leader in a fight with dozens of soldiers and Agents. Morpheus and Trinity exit the Matrix through a "hard line", a telephone line in the Matrix which may be used to safely exit from the Matrix. However, before Neo can follow, the phone booth being used as an exit is destroyed by Agent Smith, the leader of the Agents. Neo duels with the program, destroying the agent's current body. He then flees as a new Agent Smith arrives, having possessed a new person. 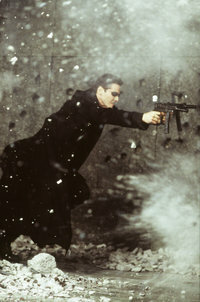 Neo is chased through the city by Agents. Upon reaching another exit, Neo is shot in the chest by Agent Smith and slumps over, apparently dead. At this moment Neo fully recognizes the fabricated nature of the Matrix and thereby teaches his brain that death in the Matrix does not imply death in the real world. Simultaneously, in the real world, Trinity refuses to accept Neo's death, and whispers into his ear that she now believes what the Oracle's prophecy foretold. It remains ambiguous as to whether he reawakens due to his transcendence inside the Matrix, the power of Trinity's love outside the Matrix, or simply the physical stimulus on his body from Trinity's kiss. Empowered by this newfound realisation, Neo transcends the limitations of the virtual world and effortlessly defeats Agent Smith, "deleting" him from the Matrix before returning to the real world. A short epilogue shows him back in the Matrix, promising the Agents that he will be leading the fight against them.